Abstract: In patients without tissue availability at presentation, the analysis of cell-free DNA derived from liquid biopsy samples, in particular from plasma, represents an established alternative for providing epidermal growth factor receptor (EGFR) mutational testing for treatment decision-making. Compared with quantitative polymerase chain reaction and digital polymerase chain reaction-targeted methods, next-generation sequencing can provide more information about tumor molecular alterations, especially EGFR mutations. Here, we present a case of a patient with non-small cell lung cancer (NSCLC) harboring 3 uncommon mutations of EGFR-R670W in exon 17 and H833V, and H835L in exon 21, as shown by next-generation sequencing of plasma cell-free DNA. 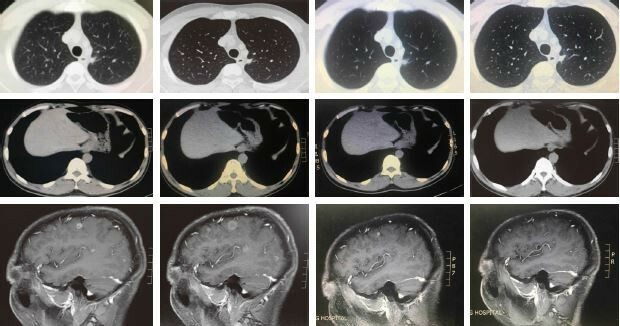 To the best of our knowledge, this is the first case report of a patient harboring the R670W mutation. The patient responded well to second-generation tyrosine kinase inhibitors (TKIs). T790M is an acquired resistant mutation in patients with R670W, H833V, and H835L. This is also the first case of a patient harboring the H833V/H835L/T790M triple mutation; the patient had a good response to the third-generation TKI osimertinib. In this work, we also performed a literature review on the clinical characteristics of NSCLC patients with the H833V/H835L double mutation, together with a descriptive analysis about their response to EGFR TKI monotherapy as a first-line treatment, according to data from previous case reports. The results showed that the cohort of NSCLC patients with H833V/H835L responded well to EGFR TKIs; thus, before treatment in clinical practice, screening for EGFR mutations should be conducted and EGFR TKIs should be preferred in NSCLC patients with H833V/H835L mutations.